I've fallen off of the radar scope, blog-wise, and for that I apologize. I've said yes to a couple volunteer projects, because as a retiree I have time to spare (ha ha! ), and they seem to all be coming to a head this week, along with an important family celebration. And I start my first full-time civilian job on Tuesday. Nothing like a challenge, right? Luckily it's working with folks I know and it's a mission I am excited about. It's the story of Louie Zamperini, a troubled kid that grew into an Olympic champion in track, then was shot down over the Pacific and survived incredible cruelty as a POW. 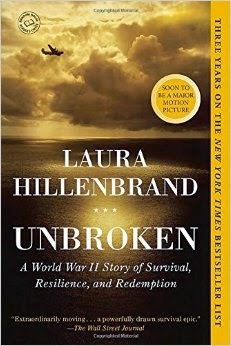 The movie is about to come out, and it looks intense, but please read the book. Or in my case, listen to it. You will find yourself driving the extra long way home because you are so into the story.